We’d love your help. 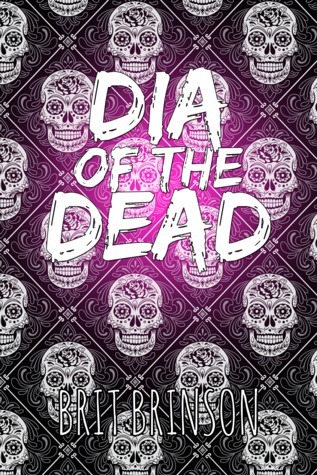 Let us know what’s wrong with this preview of Dia of the Dead by Brit Brinson. At the majorly important birthday party of her boss’ daughter Protecting Romero High from all things supernaturally spooky as Dia Muerto is a tough gig for sixteen-year-old Dia Summers, but it’s nothing compared to protecting the ones she loves from real, live—well, formerly alive—zombies. Unlike the zombies that shambled around on set, the real deal don’t follow a script. To ask other readers questions about Dia of the Dead, please sign up. This is the Walking Dead with teenagers as the lead. And not just because it has zombies. Despite the cute conceit — actress who plays a zombie badass on tv is forced to fight real zombies! — this book is dark. Major characters die gruesome deaths. Teenagers are forced to kill people they care about. Once the action starts, there aren't really any moments of safety or opportunities for characters (and the reader) to breathe. At the start, the characters all seem very stereotypical — almost carica This is the Walking Dead with teenagers as the lead. And not just because it has zombies. Despite the cute conceit — actress who plays a zombie badass on tv is forced to fight real zombies! — this book is dark. Major characters die gruesome deaths. Teenagers are forced to kill people they care about. Once the action starts, there aren't really any moments of safety or opportunities for characters (and the reader) to breathe. At the start, the characters all seem very stereotypical — almost caricatures. Over the course of the book, they gain dimensionality, some in ways that I haven't really seen a YA book handle before, and I'm really interested in seeing how this plays out in the next book. The one real criticism I have is that we only start seeing these additional dimensions when we're more than halfway through the book; you're dealing with the caricature versions for a long time. This was a fun YA Zombie horror tale with a smart, tenacious Afro-Latina protagonist you absolutely can't help but root for. So far, this is Brit Brinson's only book, but I hope to read more from her in the future! Interesting spin on a zombie/end of the world story. Can't say much more than that without ruining the surprise. Dia of the Dead was entertaining as well funny. Dia had to endure a hollywood party, which she did not like that is where it begins to turn fun. If you like the zombie attacks this is perfect. What changes people or how a group of kids get together is for the reader to find out. What I will say is it is a page turner and entertaining. Giving this a 4/5 star rating. given a copy for a honest review. I enjoyed the book, the story moved fast. A lot of the character traits and situations were definitely inspired by TMZ, Radaronline or one of the blind item websites. Interesting end that leaves it open for a sequel. As someone who had the privilege of reading an early draft of DOTD, I feel like I've been there to see Dia of the Dead develop into the fun and adventurous book we now know. Brit has a great mind for crafting a scene in a story and making relatable characters (although I'm probably twice the age of most of the characters in the book). Even in early drafts, I could tell exactly where Dia was, or know the details surrounding her. Brit created a great world that mixes Fear The Walking Dead and Nicke As someone who had the privilege of reading an early draft of DOTD, I feel like I've been there to see Dia of the Dead develop into the fun and adventurous book we now know. Brit has a great mind for crafting a scene in a story and making relatable characters (although I'm probably twice the age of most of the characters in the book). Even in early drafts, I could tell exactly where Dia was, or know the details surrounding her. Brit created a great world that mixes Fear The Walking Dead and Nickelodeon. For any YA reader or author, DOTD is a must-read. Not only is it a great story in the life of Dia Summers, and leaves you hanging and wanting more, it serves as great inspiration for any aspiring YA author out there. DOTD is a template to be studied.